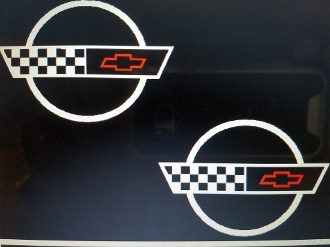 CORVETTE C4 EMBLEM DECAL FOR FUEL RAIL COVERS 1992-1996. CHOOSE COLOR FOR THE LOGO, BOW TIE , AND BACKGROUND/OUTLINE (IF OPTION CHOSEN). YOU GET 2 DECALS WITH THIS ORDER.